So, finally.....a few photos of our apartment. 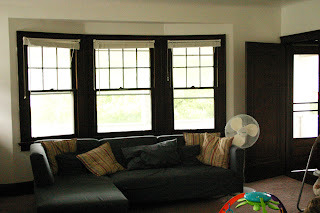 In our living room I like the three front windows. That door goes out to our patio in the front. Sadie & I go out there to blow bubbles & use the play dough & sidewalk chalk & what not. 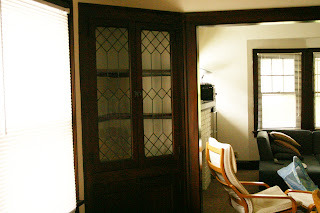 These cabinets are in the dining room. There are two. One on each side of the windows. I don't have anything cool to display in these. Really wish I did. My kitchen. Well, one side of it. The other side has the stove, which is filthy. I'm not sharing a filthy stove w/ y'all. 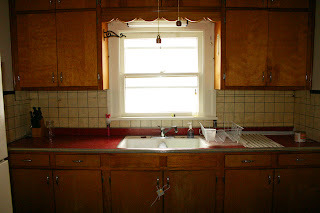 Yucky old cabinets, crazy red countertops & linoleum like stuff on the walls. I asked Dylan if I was crazy because the pink bathroom tile is actually growing on me. He replied with a "yes." 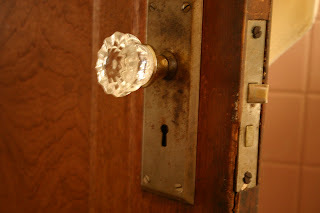 This is the doorknob to the bathroom. We have a few glass doorknobs in the house. The rest are metal. Just a few peeks inside. Hope this settles some of your curiosity. Your place is kinda cute. I love it. It really has character. I think you will always remember this place! I think that the awesome windows and doorknobs make up for the kitchen and pink tile. I have always wanted to live in an OLD place. I think that they are cool. Steve does not share this same desire. Ok Candace, this is the COOLEST place ever! How are you guys not dying that you found such a unique place to live!!! Its all perspective. 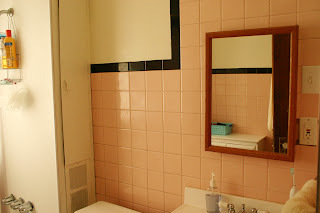 Pink tile is way fun, especially since you have two girly girls! What a great place to live for a while, imagine the memories Sadie will have! "Mom did we havea red counter in the kitchen?" You guys will have FUNNY memories forever with this home- its DARLING!